The giving of gifts both delights the recipient and pleases the giver. Practiced in all societies, gift exchange has a history as long as humanity. This gloriously illustrated catalogue is the first investigation of gift-giving and its impact on the development of art in the Islamic world. Presenting some 240 rare and costly works of art associated with gift exchanges among the courts of Islam, Byzantium, western Europe, and eastern Asia, the book provides a wide-ranging view of Islamic art and culture from the 8th through the 19th century. 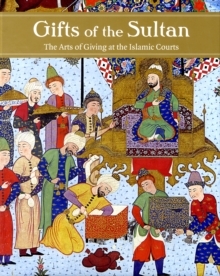 At courts across the Islamic world, gift-giving often served as a nexus of art and diplomacy, religion, and interpersonal relations. The book examines the complex interplay between artistic production and gift-based patronage through numerous examples of deluxe, aesthetically pleasing objects either commissioned or repurposed as gifts. Tracing the unique histories of selected artworks, the book also explores how the exchange of luxury objects played a central role in the circulation, emulation, and assimilation of artistic forms within and beyond the Islamic world. Pages: 336 pages, 250 color illus.